This comfortable cottage is in a rural position on a main road in the Peak District National Park yet is just 100 yards from the local pub village shop and excellent footpaths. With the Dove Manifold and Goyt valleys all on its doorstep guests will be hard pressed to tire of the local area and its spectacular scenery. The whole cottage enjoys far reaching views across the surrounding hills and valleys Historic Chatsworth Bakewell Alton Towers and Matlock Bath are just some of the popular destinations which are in easy reach of the property. The cottage has a comfortable contemporary open plan layout making it a sociable space that s perfect for entertaining and relaxing. 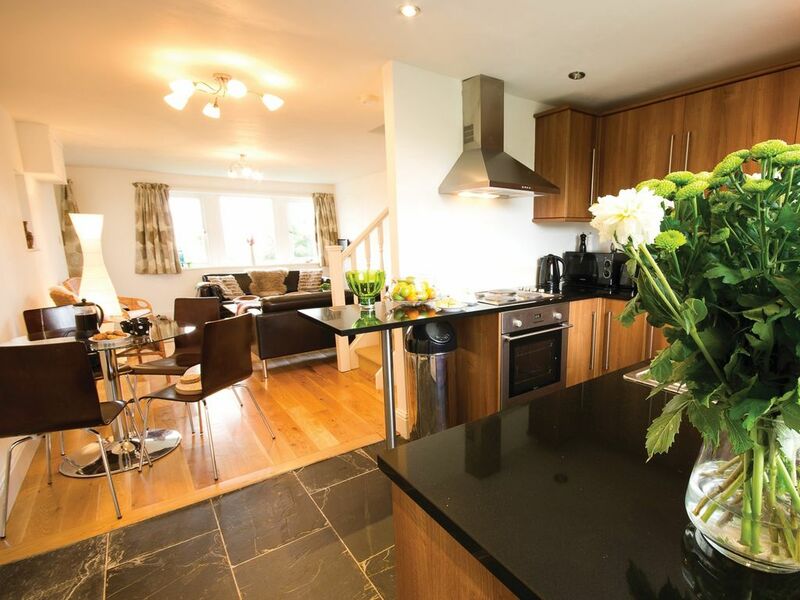 The kitchen has stylish slate flooring granite worktops and timber units with spotlighting and a small breakfast bar. Just beyond is the dining table for four and to the other side of this is the large sitting area. With solid oak flooring electric effect log burning stove two comfortable sofas and armchairs this is the perfect space in which to relax after a long day of walking or sightseeing. Upstairs the master bedroom has a double bed stylish white furniture and views to the rear of the cottage. The second bedroom has two single beds ideal for children or adults a wardrobe with draws and looks out over the front. The rooms share a family bathroom with shower over bath and useful heated towel rail. Outside there is a garden to the front which enjoy the stunning views.